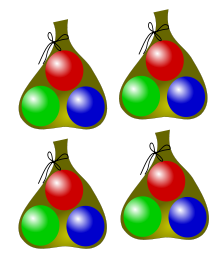 Fower bags wi three merbles per bag gies twal merbles (4 × 3 = 12). Multiplication (eften denotit bi the cross seembol "×", bi a pynt "⋅", bi juxtaposition, or, on computers, bi an asterisk "∗") is ane o the fower elementary mathematical operations o arithmetic; wi the ithers bein addeetion, subtraction an diveesion. The multiplication o hale nummers mey be thocht as a repeatit addeetion; that is, the multiplication o twa nummers is equivalent tae addin as mony copies o ane o them, the multiplicand, as the vailyie o the ither one, the multiplier. This page wis last eeditit on 21 Dizember 2017, at 17:55.